One of the results of the last few years is that all of us were “shaken out of our normalcy.” Things we took for granted, life paths we did not question, directions and beliefs, all were turned upside down. Many people now find themselves adrift — what meaning does their life really hold? What should they be turning to right now to maintain balance and serenity? 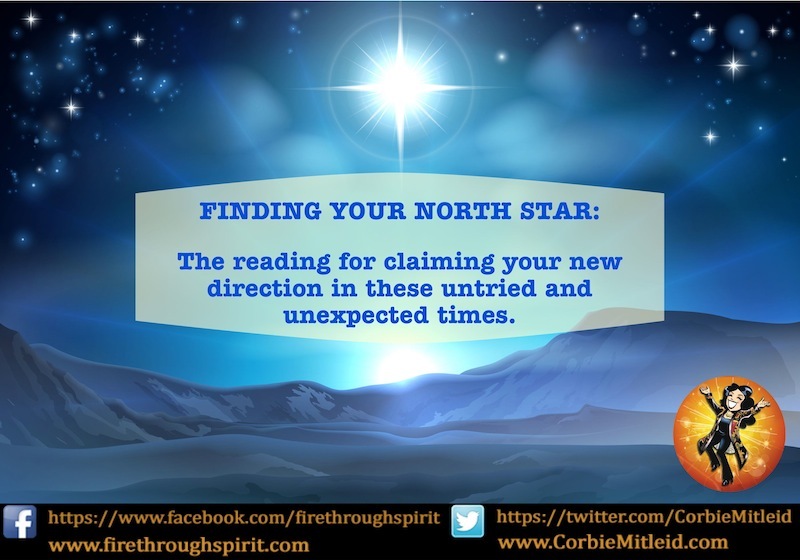 Our new service, Finding Your North Star, specifically addresses those questions by means of a spectrum of complementary methodologies — Angel Cards, Medicine Wheel Cards, Runes, Numerology, traditional Tarot and the Dakini System, plus a channeled message from your Soul/Higher Self. You will receive Corbie’s full audio session on MP3. Both outline the major and minor themes and threads that are weaving themselves into your life’s tapestry at this nexus point, along with suggestions on how you might best use these ideas to bring your life balance, meaning and achievement at this time. The North Star, the Pole Star, is the one unchanging brilliance in the night sky. With Finding Your North Star, you can re-assess your Path’s essential core and claim your new direction for these untried and unexpected times. Order this extensive life commentary!